A few years ago, Herb Ohta Jr. was kind enough to share a tab he had made for his song, “Sand Castles,” with me. Even more exciting, he also gave me permission to post it on the site. Sand Castles is one of my favorite tunes from his album ‘Ukulele Journey. It has a strong melody and really exemplifies Ohta’s mastery of the instrument and style. The tab he sent was a solo arrangement of the song based off of what chords and fingerings he had found easiest to teach his students. But, while it was close to the original, his own tab shortcut some of the brilliant intricacies of the lead ‘ukulele that are so signature to his style. I decided to make an additional version of the tab that would be a note for note (or at least as close as possible) transcription of the lead ‘ukulele part. While I was at it, I also added some more chords to the lead version to give a general overview of how I might play the song by myself (which is quite different than his tabbed version). So here are three versions of the same song to give you options and ideas for piecing together your own arrangement of one of my personal favorites. 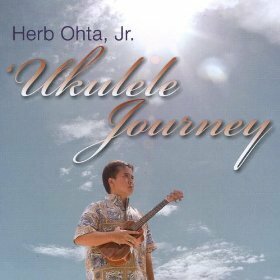 Learn more songs by Herb Ohta Jr.